How could so much money and labor go into chiseling holes through the mountains, laying a road bed, only to be walked away from? Twice! It is a story of greed and revenge. Two robber barons, whose only goal was to be richer, fought each other with rail lines. Back in the late 1800’s, railroads had a virtual monopoly on transportation, and connecting Philadelphia to Pittsburgh and Ohio was an early goal. William Vanderbilt who owned the NY Central was angered when George Roberts built the Penn Central Rail Road. To get revenge, he started the South Penn Rail Road. $16 million and 5 years were allocated, but at the end of 5 years the line was only 40% complete and $10 million had already been spent. Realizing that it would never make money, one of his major backers, J.P. Morgan, sold his shares to a competing railroad, thus pulling the plug in 1885. Thousands of workers had labored in the tunnels for $1.25/ 10 hour day, 26 of them lost their lives and the unfinished project became know as Vanderbilt’s Folly. (Read more history here) The South Penn Railroad was abandoned. It sat fallow until it was resurrected to become “The Highway of the Future”. The History of the Pike 2 Bike trail! Our nation’s first limited access toll highway opened on October 1, 1940, with hundreds of motorists waiting for days to be the first to ride “The Road of the Future”, the Turnpike was an immediate success. Easy and fast. Nothing to slow you down (not even a set speed limit at first, and then 70 mph), nothing except the tunnels. From the start they were bottle necks. The 4 lane traffic funneled to 2 opposing lanes. Trucks had little clearance and traffic often backed up for miles. In the 1960s, four of the tunnels were “twinned” and retrofitted with new lights and tile walls, while 3 were bypassed. 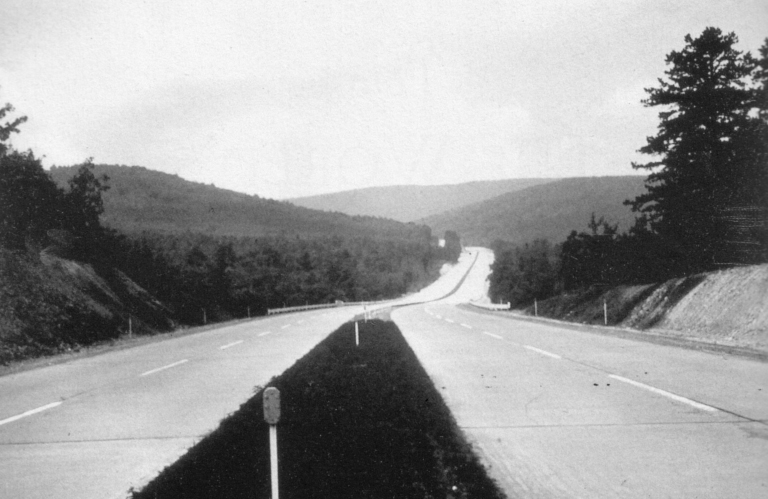 ​In 1968 the Pennsylvania Turnpike Commission (TPC) bypassed the Ray’s and Sidling Hill tunnels and 11 miles of pike. 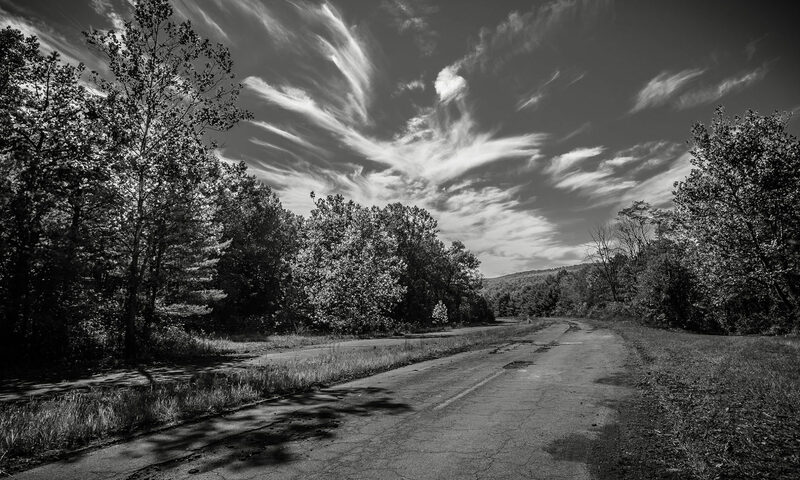 Then the highway was completely abandoned…again! This section was used by the TPC to train snow plow drivers, prototype rumble strips, road reflectors, reflective road pant, do vehicle crash, roll over, truck brake distance, and road sign distance visibility tests. They also stored jersey barriers here. State troopers patrolled the section to stop vandalism. Mostly it just went to seed. While scouting the nearby BicyclePA Route-S, Joe Stafford was hoping to avoid the traditional challenges of Sidling Hill on Rt. 30, but was unable to find a reasonable alternative on existing roads. Announcing this to the BicyclePA chairman, John Schubert in a meeting of volunteers, John joked that “What Joe needs is a couple of holes in the mountains.” Western Pennsylvania trail guru Bill Metzger who was also at that meeting and who is a railroad history buff responded, “They are already there.” Noting that the abandoned Turnpike bypassed this mountain pass with a flat easy road section, a task force including PennDOT and the Turnpike Commission explored this new opportunity for re-use. The Turnpike Commission was looking to dispose of the liability and it was eventually agreed that The Southern Alleghenies Conservancy (SAC) would purchase the land with intentions to have another entity manage the trail. On November 2001 with TV cameras and dignitaries watching, the Turnpike Commission handed over the trail for $1. In 2003 an advisory committee was formed, by-laws drafted, and in 2004 officers were elected; “Friends of the Pike 2 Bike” has managed and watched over the trail since. The officers were Bob McKinley, Bill Plank and Murray Schrotenboer. In 2004 grant money from the Lincoln Highway Heritage Corridor, PA Department of Conservation and Natural Resources, and the United States Department of Agriculture Rural Business-Cooperative Service allowed SAC to hire Gannet Fleming to produce a Master Plan and Adaptive Re-Use Study, which was completed in August 2005. In 2005 the bridges at each end of the trail were removed making the trail separate from the turnpike. In the summer of 2006 the Turnpike Commission disassembled the last original toll booth which had be re-erected at the Tour-ed Mine in Pittsburgh and delivered it to the trail, where it joined the other booth at the CCC camp. After vandals started stealing the aluminum and scattering parts, both booths were removed for safe keeping and will hopefully be re-assembled at each trail head. The study showed that it would take about $3.5 million to finish the trail. The tunnels need stabilizing, and some lighting, drainage issues needed to be dealt with, trail heads, toilets, interpretive signage, and parking lots were envisioned. But where do we get the money? The Department of Conservation and Natural Resources. But they could no longer give grants to non-profits. So the trail needed to be transferred to the counties. Unfortunately politics entered into the picture, and the trail went into deep freeze for a number of years. Of the 4 people that were advocating for the trail from the beginning, one moved, one was killed in a car crash, and one retired. This left the care of the trail to Murray Schrotenboer. At Jeff Kloss’s (Bedford County Planning Commission head) retirement lunch, Murray cornered Jeff’s replacement, Don Schwartz and insisted that he see the trail. That was all it took. Don immediately knew how important the trail was and set about to complete the work. One consulting company set about to form a Recreational Authority to purchase the trail. Utilizing the money from the Marcellus Shale Fund, Don employed Fourth Economy, to create another study that emphasizes the economic returns to the counties.